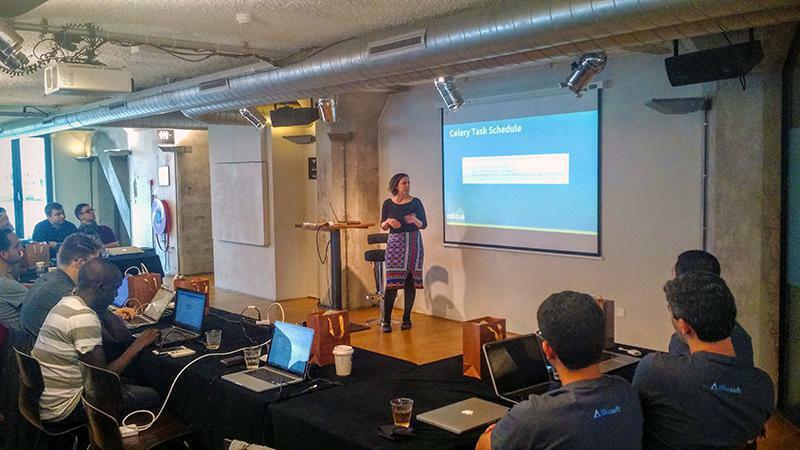 Developer Erin Mullaney was just in Amsterdam for RapidCon, a UNICEF-hosted event for developers using RapidPro, an SMS tool built on Django. The teams that have worked on RapidPro and its predecessor RapidSMS have gotten to know each other virtually over the years. This marks the second time they’ve all come from across the globe to share learnings on RapidPro and to discuss its future. RapidPro has the potential to transform how field officers build surveys, collect data, and notify populations. It allows users with no technical background to quickly build surveys and message workflows. With over 100% cell phone saturation in many developing regions, SMS presents a cheap, fast means of reaching many quickly. Erin worked closely with UNICEF Uganda in the development of a data analytics and reporting tool called TracPro for RapidPro. The organizers invited her to speak about the tool with other RapidPro users. Erin: The conference was amazing and I was ecstatic to go. Meeting the folks who work at UNICEF for the first time was exciting because we normally only speak via audio over Skype. It was nice to see them in person. We had an evening event, so it was fun to get to know them better in a social atmosphere. It was also a great opportunity to get together with other technical people who are very familiar with RapidPro and to think about ways we could increase usage of this very powerful product. What was your talk about? Erin: The title of my talk was “TracPro: How it Works and What it Does”. TracPro is an open source dashboard for use with RapidPro. You can use it for activities like real-time monitoring of education surveys. Nyaruka originally built it for UNICEF and it’s now being maintained by Caktus. I was one of two developers who worked on TracPro at Caktus. We worked to flesh out the data visualizations including bar charts, line charts over date ranges and maps. We also improved celery tasks and added other features like syncing more detailed contact data from RapidPro. What do you hope your listeners came away with? Erin: I delved into the code for how we synced data locally via Celery and the RapidPro API and how we did it in a way that is not server-intensive. I also had examples on how to build the visualizations. Both of those features were hopefully helpful for people thinking of building their own dashboards. Building custom dashboards in a short amount of time is really easy and fun. For example, it took a ShipIt Day I to build a custom RapidPro dashboard for PyCon that called the RapidPro API. What did you learn about RapidCon? Erin: People discussed the tools they were building. UNICEF talked about a new project, eTools, being used for monitoring. That sounds like an interesting project that will grow. RapidPro has had exponential usage and growth and Nyaruka and UNICEF are working really hard to manage that. It was interesting to learn about the solutions Nyaruka is looking at to deal with incredibly large data sets from places with a ton of contacts. They’ll be erasing unnecessary data and looking at other ways to minimize these giant databases. UNICEF is pretty happy with how RapidPro is working now and don’t expect to add too many new features to it. They’re looking ahead to managing dashboard tools like TracPro. So their focus is really on these external dashboards and building them out. The original RapidPro was really not for dashboards. What was the best part of RapidCon for you? Erin: It was pretty cool to be in a room and selected for this. I was one of only two women. Having them say “You have this knowledge that other developers don’t have” was rewarding. I felt like I had a value-add to this conference based on the past year and a half working on RapidPro-related projects. Will you be sharing more of your RapidPro knowledge in the future? Erin: So far, we’ve been the only one giving a talk about RapidPro, it seems. I gave a RapidPro talk at PyData Carolinas this year with Rebecca Muraya, Reach More People: SMS Data Collection with RapidPro and during a PyCon 2016 sponsor workshop. I’ve been encouraged to give this talk at more conferences and spread the word about RapidPro in order to get the word out further. I plan to submit it to a few 2017 conferences for sure! Thank you Erin for sharing your experience with us! To view another RapidPro talk Erin gave during PyData 2016 Carolinas, view the video here.